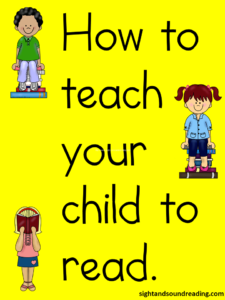 Today I wanted to post on how to teach your child to read. I thought this would be a great goal for many of you – help your child learn to read! Do your children set goals? You may remember our free worksheet for kids to help your children set goals. My five year old has a goal to be able to read before he starts kindergarten. He is on Day 20 of our Learn to read free program and he is reading like a pro! I am so proud of him! Perhaps you have a little one that you would like help learn to read? If so, you are in luck! Sight and Sound Reading is just the place to help you do this… Here is how you can help your child learn to read! 1) Determine if your child is ready to read. Use our free reading readiness test. If you have a struggling reader, learn how to help your struggling reader. 2) If your child is ready to read, learn to read for free by starting on Day 1 using our free videos and worksheets. The way our program works: Eighty percent of the words beginning readers read are sight words. We start by teaching the children sight words in the context of a story. The words build upon themselves each day. The children gain confidence because they know all of the words they are reading and they don’t struggle at all. Slowly we introduce phonics and teach the children how to sound out words. 3) After your child has completed Day 20-25 of the program, you can start to introduce more phonics. Help your child with phonics using our phonics videos and word family videos. 4) If you would rather teach your child to read yourself -we made that easy too. We offer a teacher’s manual or a premium membership that has word for word instructions of what to say and do. If you don’t want to print all the worksheets, we offer a workbook from amazon. So.. are you going to make a goal in 2015 to help someone learn to read? We hope so! Let us know how we can help and what questions you have! I am a kindergarten teacher. I have taught K for 27 years. I am always searching for new techniques as children learn in different ways. I am interested in ideas to help some of my struggling readers and want to share ideas with their parents for summer practice. Fantastic! I am glad you arrived on our site. I would love to help you/I have a few ideas on what parents can do to help. I will send you an email so we can connect through email. Hello, i am a mother of 8 year old boy who struggles with reading. I will begin with your program ASAP. If you have any idea to help please email me. I plan to home school. My oldest is 3 and is obsessed with books. I would love to give her a head start but just have no idea where to even start. Can you send me more information with your program. I just found your site and am planning to get started with my 5 year old daughter. She knows her letters and sounds, she can identify the first sound in words but that is as far as I have gotten. I have tried a couple of different phonics programs but with no success. We will start Day 1 tomorrow. Any tips other than what I have read on your site? Thank you for all you do. Teaching my child to read is very scary. You can also always ask in our facebook group, OR, email me: [email protected] – I am happy to help… But, have no fear…teaching reading is easier than you think and we will help you every step of the way!